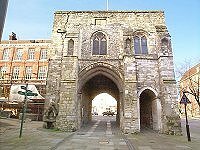 The Westgate dominates the upper end of the High Street and is close to the Great Hall. It is one of the two surviving fortified gateways in Winchester. There is evidence of 12th century construction, and modifications in the 13th and late 14th centuries. A portcullis and two early gunports in the western façade were part of the later remodelling. The Westgate has been used as a Coffee House, a lockup prison, and as a debtors’ gaol. In 1898, the City Corporation acquired the Westgate and began to use it as a museum and repository for the City archives. Today, displays include the historically important collection of pre-Imperial weights and measures, and a fine painted ceiling from Winchester College which was made on the occasion of Queen Mary I’s marriage to Philip of Spain in Winchester in 1554. There is access to the roof (up steep staircases with rope handrails) for extensive views along the High Street and towards the Great Hall of the castle. Unfortunately there is no wheelchair access.